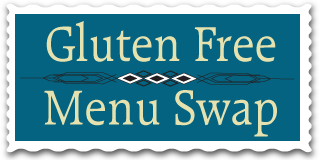 This week’s theme over at the Gluten Free Menu Swap is strawberries!! And I love strawberries! When I was small, my grandparents grew strawberries and every spring we would get our fill. And to help preserve some of the harvest for later, my mom and grandma would make strawberry freezer jam, which I loved to eat over ice cream. Yum! This week I am going to try a couple of new strawberry recipes. Pasta with Asiago Cheese and Spinach with Salad – we didn’t get to this last week. Homemade Pizza and salad – I had a request for pizza AND bread, so I will use the HBin5 Gluten Free Crusty Boule recipe for the crust and make a loaf of bread or maybe some naan. Gingered Skirt Steak with Snow Peas and Rice – we will be making it with tofu and using all the snow peas from the garden. Veggie Burgers and Strawberry Spinach Salad with Avocado and Champagne Vinaigrette – I haven’t decided yet whether I will make my own veggie burgers or if we will just eat some out of the freezer. In keeping with the theme of strawberries, I might also try my hand at making some of Amy’s Strawberry Orange Cornmeal Cakes. 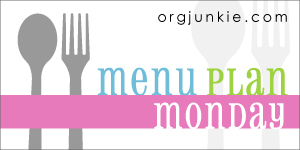 This week’s Meal Plan is also linked up to Org Junkie’s Meal Plan Monday where you will find a TON of other menus for inspiration. Be sure to check it out! Thanks for joining us again for the GF menu swap. I wasn’t surprised to see your strawberry menu items. I’ve had my eyes on those recipes, too. I’d love to hear what you think of them. Thanks for hosting again Heather!